Harry Phillips was born in Thame on the 6th April 1908 to Harry and Eliza Jane (nee North) Phillips. They lived at 36 North Street, Thame. His father worked as an omnibus driver. Harry worked as a carpenter for Howland Builders at Queens Road. 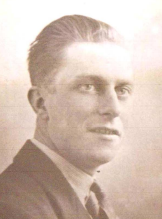 He was married at the age of 29 to Emma Hillsdon (nee White) on 5th February 1938. They had three boys: Michael, Geoffrey and Anthony, and lived at 59 North Street, Thame. Harry went to war with the Royal Berks Regiment but was held back due to illness and ended up being put with the 8th Battalion Manchester Regiment. In 1943 the regiment went to the Middle East and the war in Italy. 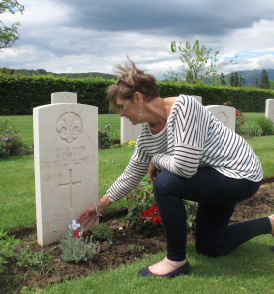 He was on duty on the Front Line in Italy when he was killed. Some shells came over and exploded near him. A splinter hit his head, killing him instantly. 14570236 Private Harry Phillips, Manchester Regiment is buried in Arezzo War Cemetery, Tuscany, Arezzo, Italy and is remembered in Thame on the war memorial and St Mary’s church memorial board. Report written by Gayna Gurdon (nee Phillips) his granddaughter.